Moving on. 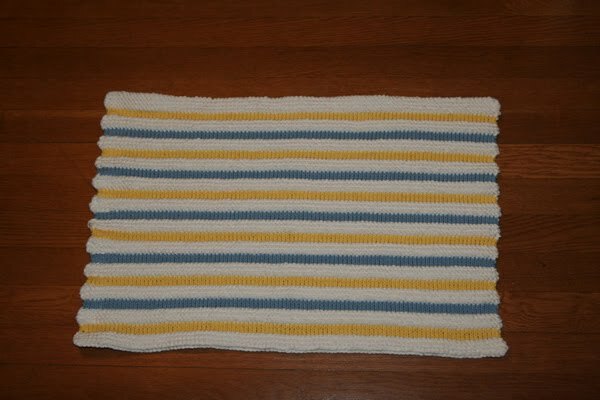 I have finished a Christmas gift! It is for my mom, so if you happen to know her...sshhhh. But here it is. I stole this idea - and borrowed the pattern - from my friend who made one first. I think I like her color choices better, but it's not for me it's for my mom and she has different taste in color. Sorry for the pet-indulgence, but Clarence is very attracted to the yarn and the camera battery died before I could get more photos. Next is the hood, which will be an interesting challenge. The hood is designed very large, but I'd like to be small enough that I can actually wear it as a hood without flopping down over my face. It seems like it should be simple, but I've only ever knit one other hood and it was constructed in a completely different way. I'll keep you informed about how it goes! 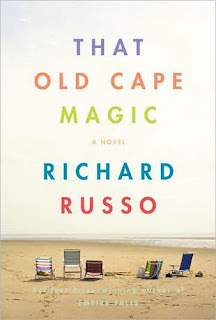 Richard Russo's latest is about a marriage falling apart, with a great deal of influence from the in-laws. Jack Griffin's was born of two college professors who immediately disapproved of his wife, Joy, because she didn't do graduate work. Their own marriage was rather a mess itself and Griffin spent much of his life trying not to repeat their mistakes. The narrative thread was hard for me to follow, as the story was told mostly in flashbacks; indeed, there were flashbacks within flashbacks. At the beginning of the story Griffin and Joy are heading to a wedding and within that present Griffin shares a great deal about his earlier life and his parents' marriage. Then it skips ahead to the day after the wedding and flashes back to the wedding itself. Continuing along this way for the duration of the book, I became disoriented a number of times because I didn't know where I was. Though the story was rather dismal and the characters flawed to a point that I couldn't sympathize much, there were some things that I liked. Minor characters Sunny Kim and Marguerite were more interesting and colorful than the main characters, and certainly more likable. The short story that Griffin struggles with throughout the novel also illustrated some interesting perspectives about our memories of long-ago events, which was great food for thought. In general, I would say it wasn't Russo's best work. The only other book of his that I've read is Bridge of Sighs, but it greatly outshone this one. If you are reading your way through all his books it is worth reading, but I wouldn't start with it if his work is new to you. I don't know why this always happens - I don't read especially quickly, but I've just realized I haven't posted reviews on the last few books I've read. Yikes! 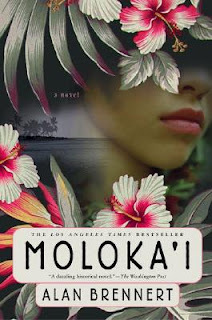 Moloka'i is a Hawaiian epic which takes place at a leper colony beginning in the late 1800’s. The novel begins when 7-year-old Rachel Kalama begins showing signs of leprosy, and she is sent first to a local hospital and then to a leper colony. The book spans her whole life, which is much longer than we might expect. 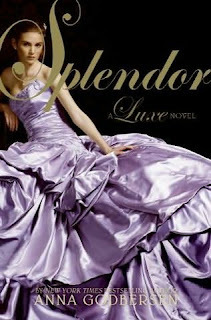 It took me a long time to read, but was very enjoyable. Though it was fiction, it is a real place and it’s a fascinating little bit of history. I highly recommend it. As a disclaimer, you should know that I know the author and read a couple early drafts of the book. But if you’ve been reading my blog for a while you also know that I’m not crazy about memoirs, so perhaps those two biases balance each other out. 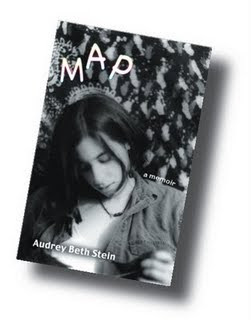 Map is a rather short coming-of-age memoir covering about an 8-month period of time in which Stein, a college student, began an online relationship with a woman she met on an Indigo Girls mailing list. It’s also a coming out story, and a story about many kinds of relationships – not just romantic ones, but relationships with friends, acquaintances, and parents. There is all the angst you would expect, and a level of melodrama that will remind you, painfully, of your first relationship. But it's also surprisingly humorous, and a couple of times I actually laughed out loud. Info about how to get the book is here, and if you want to check out some of her other writing, look at the Show and Tell section on her website. 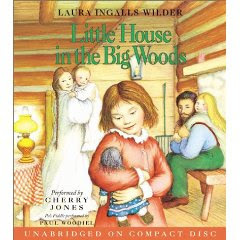 Have I mentioned that I want to be Laura Ingalls Wilder? I read this set of books numerous times as a child and was just reinspired to start them again. My mother still has my old set and I’m going to get them from her when I visit for Thanksgiving because frankly, the library copies just aren’t the same. I always loved the descriptions of how the Ingalls family lived. The toys that Pa made for the kids, the descriptions of how Ma made cheese, and the fun things they did – like making candy out of maple syrup and snow, or playing ball with a pig’s bladder. They were so resourceful and industrious, and as an adult I appreciate the simplicity and self-sufficiency of how they lived. I loved reading this book as an adult just as much as I did when I was a kid. I’m going to go churn some butter now. It has been close to two months since I've shown you my Heather Hoodie Vest, and I've come a long way since then. I apologize for being so remiss with the updates! I thought I had posted a picture of the finished back, but apparently I only did that in my head. 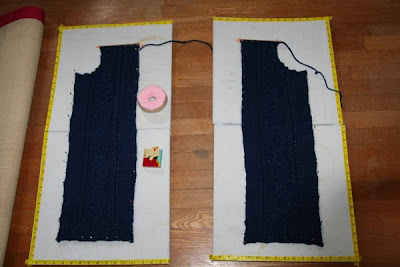 The large piece is the back, and the small piece is one of the fronts. It looks distressingly skinny, but the stockinette edges are curled under a little, and the front of the sweater will have a pretty wide button band. Also, this is making a very stretchy fabric. It will be so comfy and cozy someday when it is eventually done. 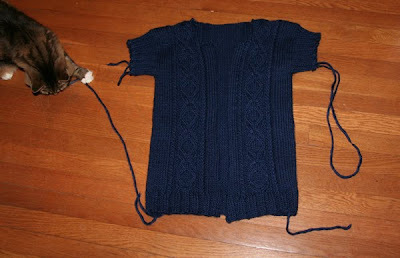 Now that the birthday socks are done I have tons of time to work on this sweater, right? I wish it were so! 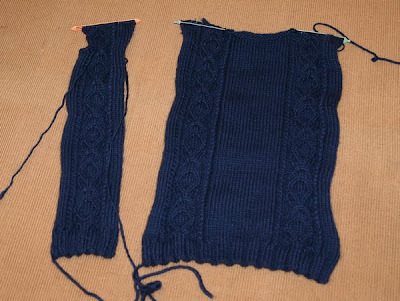 We are now solidly in Christmas knitting season, and although I am only knitting two Christmas gifts this year (unless I get suddenly overconfident) I need to get off to a running start a couple of weeks ago. Who knows when I may suddenly land my dream job and have to spend all my daytime hours working? To make it more of a challenge, one of the Christmas projects is a pair of argyle socks. Oh yes, you read that right - argyle socks! I guess the simply ribbed birthday socks weren't quite fancy enough so now I will be forced to learn new techniques. It is crazy, the things we do for love. If you know of a good pattern for man-sized argyle socks that don't involve a seam running down the bottom of the foot, please clue me in. The yarn is on its way from Knitpicks and I need to get prepared.